Not since the days of Coke vs. Pepsi has a product war been so exciting. This time, it's Starbucks vs. McDonald's. The battleground: coffee. The fight comes down to "quality" versus "attitude." Starbucks says that McDonald's has poor-quality coffee, poured by people who don't know what they're doing, and McDonald's says that Starbucks' coffee is overpriced and "snobby." Sounds about right to me! The big push at McDonald's these days is for its McCafé coffee bar, which McDonald's calls "its biggest brand launch in 30 years." Of course, Starbucks has also tried to invade McDonald's territory in the past by attempting - and not succeeding - at getting into the "breakfast sandwich" category. McDonald's fired the first shot with this out-of-home campaign, featuring the poster, below, which was placed close to Starbucks' headquarters in Seattle. 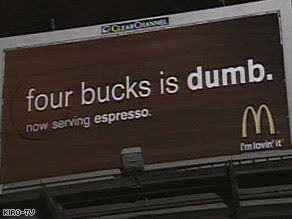 Kudos to McDonald's for using the word "dumb" - one quarter of the copy! - which you don't see in ads very much. The word is a grabber, but it does come at the risk of damaging the brand by making it look petty. 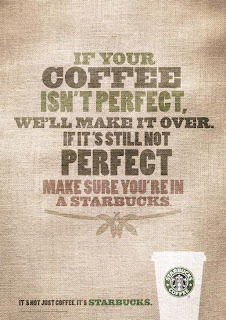 This campaign is notable because, for many years, Starbucks eschewed advertising at any kind, instead relying on publicity. It was easy to get at first, because Starbucks was the first coffee bar of its kind in North America - a homegrown version of a European tradition - and it attracted the young and hip, who have lots of disposable income. And the media love 'em. Once a product loses its excitement factor, it's time to roll out the ads. Starbucks has much less experience than McDonald's in this arena; hence Starbucks' YouTube promo, featuring CEO Howard Schultz, who explains its thinking behind the "pretty historic" campaign. It includes a roundtable discussion with Starbucks' "partners," who say they are excited that the campaign is "breakin' down the myths" and sticking it to the companies who "tell their stories at the expense of Starbucks." Sit back, relax, and..."hello, partners!!"